Through the European PROGRES programme alone, he said, the EU has invested over EUR400,000 in Aleksinac, helping it to implement 22 projects aimed primarily at strengthening the capacity of the local self-government and improving municipal services. Together with the President of Aleksinac Municipality Nenad Stankovic, Ambassador Fabrizi attended a presentation of one of those projects – geographic information system (GIS). Initially, the EU supported the GIS project through programmes Exchange 2 and EU Exchange 4, only to extend additional support to the tune of EUR150,000 for its improvement through the EU European PROGRES. As a result, the municipalities of Aleksinac and Merosina have digitised their municipal infrastructure, urban plan, natural resource, cadastral parcel and industrial zone-related databases, as well any other data concerning improved development planning, resource management and disclosing of information to the public and potential investors. 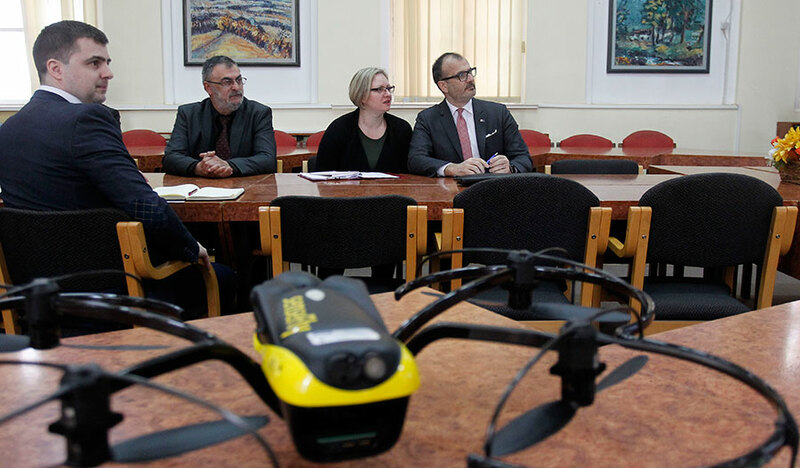 Within the same project, the municipalities have obtained a drone with pertaining equipment and software and have thus increased the quality of collected data and efficiency of their handling. “The day Serbia will become a part of the European family is drawing near, but what matters the most is helping Serbian citizens to improve their lives, the way we helped these two newly opened medical practices that show potential for further development,” Ambassador said during his visit to a young female physician and a dentist who started their own practices with support from the EU and the Government of Switzerland extended through the European PROGRES. 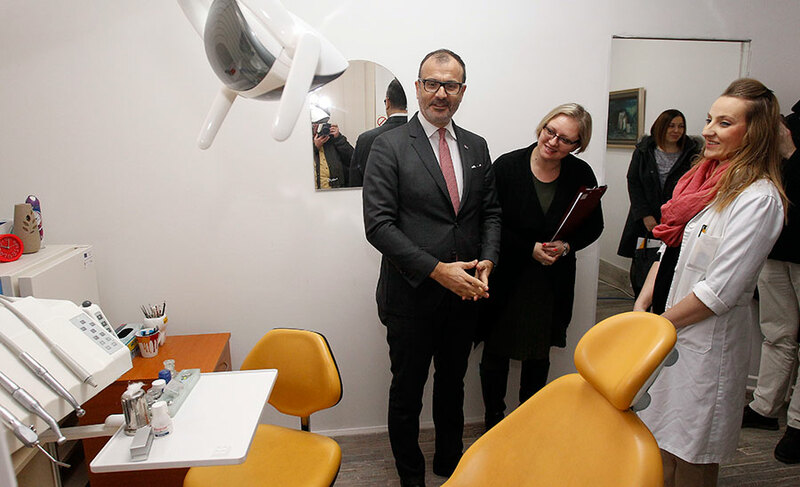 Head of the EU Delegation paid a visit to dentist Maja Ostojic who, thanks to a donation worth EUR8,300, opened her own dental clinic, and Biljana Djokic a gynaecologist who received assistance to purchase several pieces of modern equipment – fetal and Holter monitors and a radio knife. Through the European PROGRES, the donors have granted EUR356,400 and helped 43 women to start their own business, thereby contributing to promoting gender equality through economic empowerment of women. 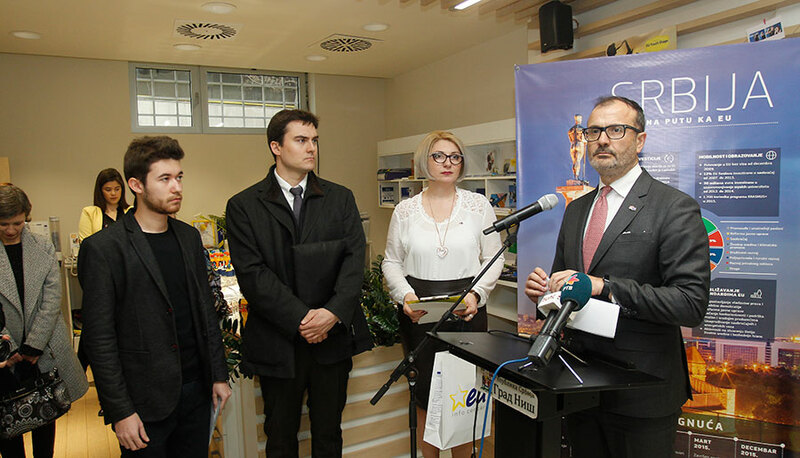 Ambassador Fabrizi announced another project to be implemented in Aleksinac as of March – EU PRO – and invited the President and his administration to seize opportunities offered by the project and prepare new actions that will bring benefits to local population, increase economic growth and boost job creation. 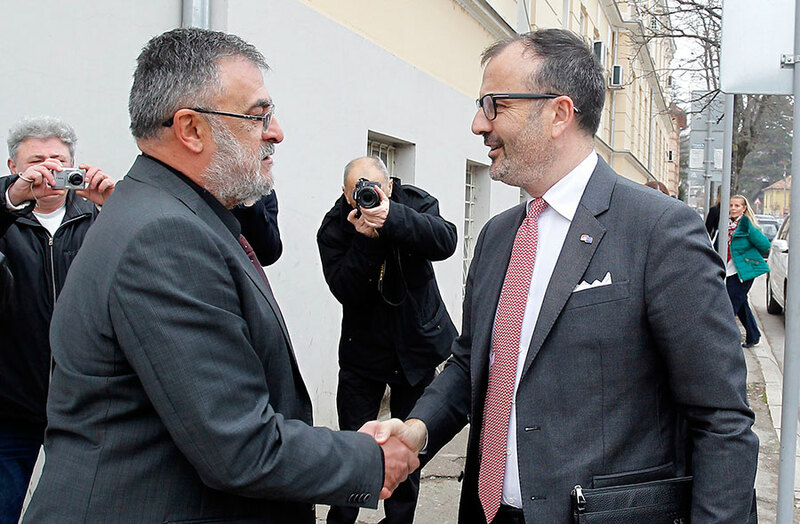 During his first official visit to Nis, Head of the EU Delegation to Serbia Sem Fabrizi was acquainted with projects implemented successfully by the EU in Nis. Among the topics of the visit was the European Year of Cultural Heritage and cultural and historic importance of the city. “Knowing that towns and municipalities will be responsible for drafting as many as 75 per cent of legislation, we assign a major role to local self-governments on our journey toward the great goal of EU membership,” Ambassador Fabrizi said. Representatives of the local Development and Project Office made a presentation of successful projects. “Thanks to EU grants, we have constructed a modern clinical centre and will reconstruct the Nis-Dimitrovgrad railway line. Another project worth mentioning is the construction of wastewater treatment facility as well as the EUR1.237,000-worth of grants invested in building apartments for the most vulnerable members of the Roma community,” said Darko Bulatovic the Mayor of Nis. Following the meeting at the Mayor’s Office, Ambassador Fabrizi and his hosts took a tour through downtown Nis and learned more about the rich history of that city. 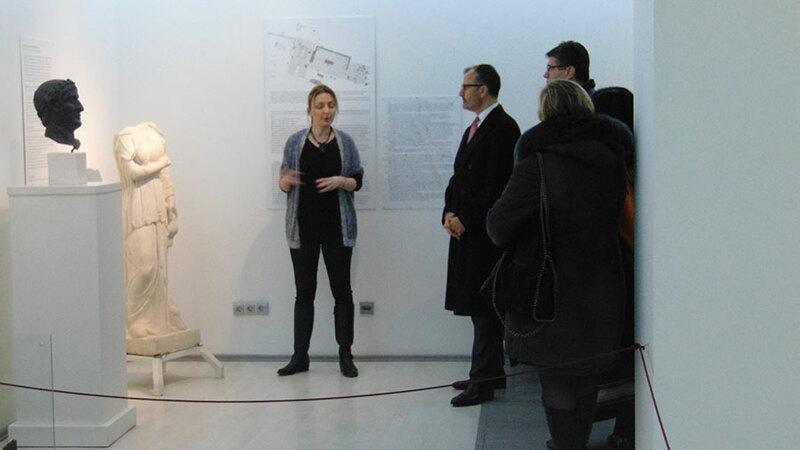 He also paid a visit to the archaeological exhibition of the National Museum in Nis, followed by a visit to the EU Info Point and Aleksandar Markovic’s exhibition Dehumanization dedicated to the victims of the Holocaust. EU Info Point public space manager Bojana Petrovic greeted numerous attendees and briefly spoke about activities of the EU Info Point. “Since May 2016, we have organised nearly 600 events – on and outside the premises – as part of important music festivals, in the streets, in the main square, in faculties, and not only among our fellow citizens, but also among the citizens of Prokuplje, Paracin, Medvedja, Zajecar, Negotin, Aleksinac, Kragujevac, etc.,” Petrovic said. The fact that we have an office here at the EU Info Point, makes me happy, makes me feel at home. Also, during our visit to the National Museum, the curator told me the entire history of this region in 15 minutes,” said Head of the EU Delegation to Serbia and reminded that the EU had designated 2018 as the Year of Cultural Heritage. Aleksandar Markovic, the author of the exhibition Dehumanization, inaugurated on the occasion of International Holocaust Remembrance Day, also addressed the audience. “My intention was to emphasise facial expressions and body language, to let people identify with what the Holocaust victims suffered through,” said Markovic for whom Dehumanization marks his first solo exhibition. Ambassador ended his visit by taking part in a debate titled “Ask me anything about the EU,” organised by the European Movement in Serbia within the project Europe for Me. Ambassador Fabrizi talked to the citizens for more than an hour, answering their questions concerning decentralisation, human rights, opportunities for farmers, the negotiating process, and bringing them closer to the Western Balkans Enlargement Strategy.